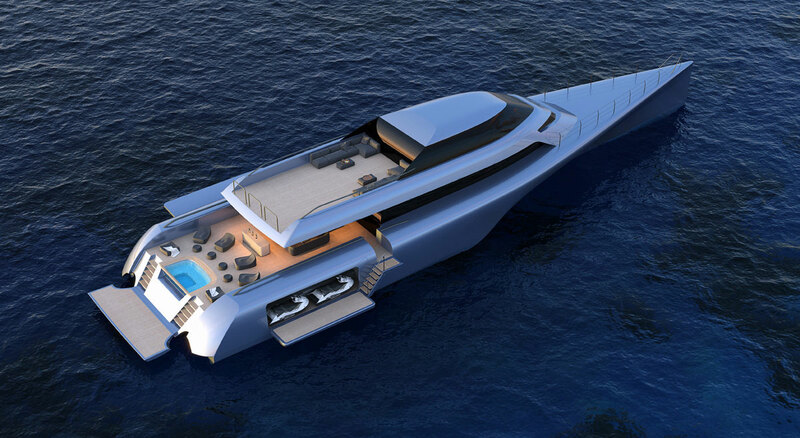 The MC155TRI is the result of a two-year design and development programme between McConaghy Boats in China and Frers Design based in Milan, with German ‘Mani’ Frers leading all aspects of the naval architecture, engineering and styling. 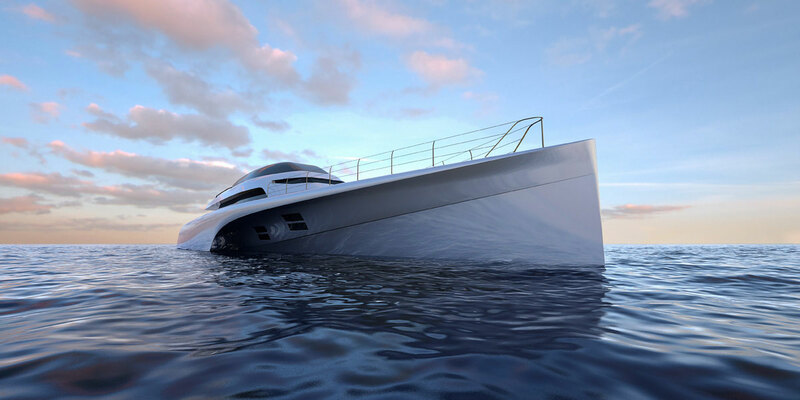 The owner’s brief was simple enough: ‘Design me an efficient superyacht for cruising the Globe that will be seaworthy – and comfortable – in any sea state’. 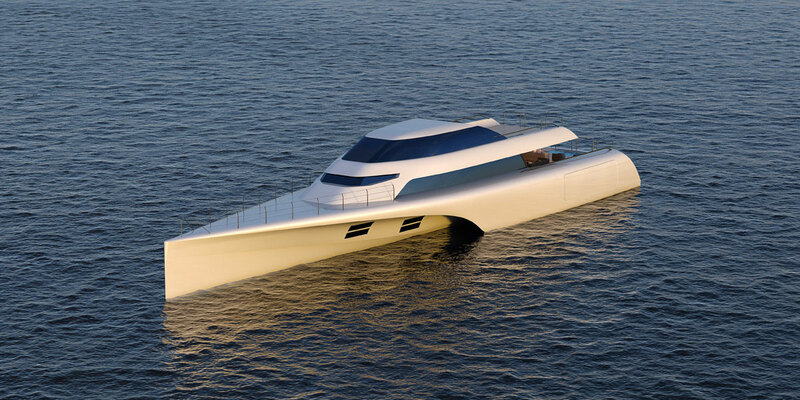 The result is a very advanced compact trimaran design with a drag coefficient so low that build and running costs equate to a monohull half her size. Indeed, test results from the Potsdam tank facility in Germany exceeded all expectations in terms of hydrodynamic resistance, pitch and roll even in 6m waves. The main hull with its fine wave-piercing entry and interaction with the outer hulls was fine-tuned using the latest computational fluid dynamics (CFD) programming to minimise both drag and motion before being tested using a scale model in Potsdam’s running and wave-making tanks to prove the concept. 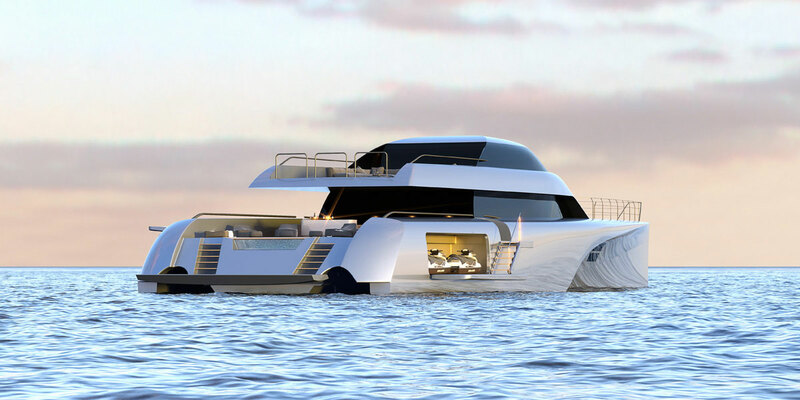 “The integration of the outer floats into the main body has allowed us to utilise the full beam of 11.2m to provide a really spacious interior for six guests, a full bow VIP suite and 2 cabins to accommodate four guests. A similar number of crew, together with all the toys including two fast tenders (a 6.5m 12 seater and a 4.2m 7 seater), 2 jet skis, diving equipment and kayaks.” Says Frers. Efficiency is not measured simply in terms of speed and fuel economy. 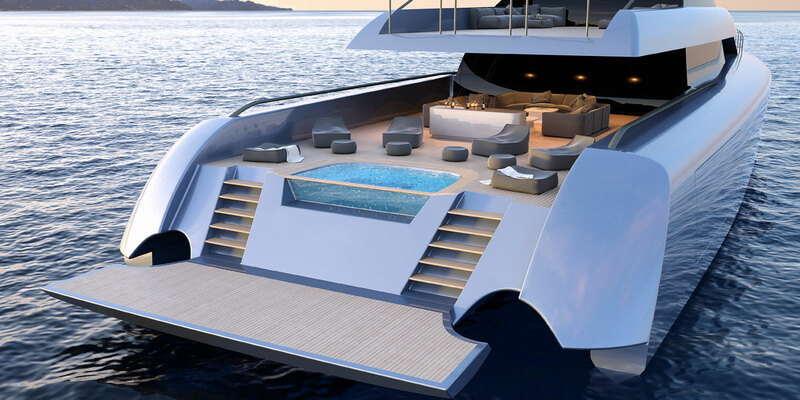 The designer has also given considerable thought to minimising the management and running of this superyacht. “I’ve often thought about commercial airplanes being handled by minimum crew, so we have worked hard to simplify handling and maintenance, incorporating proven technology to help the crew work,” Mani explains. The top deck and terrace is devoted to the owner and includes a master suite with 180° panoramic views, a lounge, a gym, bathroom and large partially covered terrace. 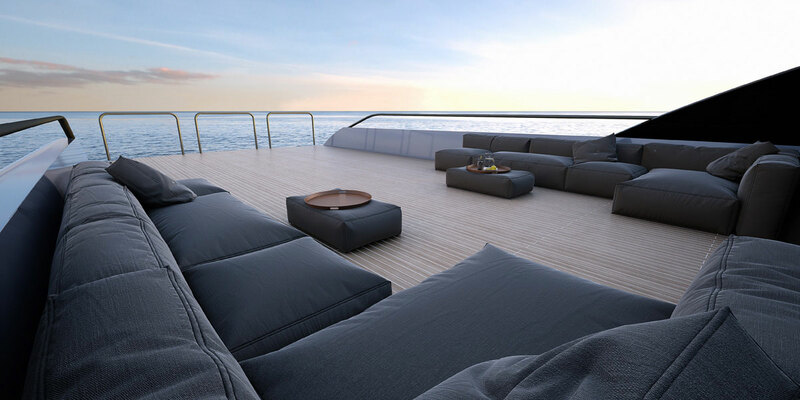 The main deck incorporates a full width veranda with bar and Jacuzzi, a full beam dining room and salon. 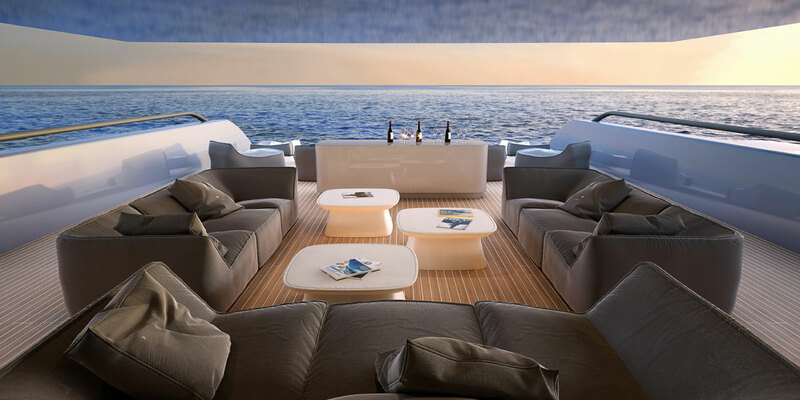 For entertainment, the whole area can be opened up from stem to stern without affecting guest and crew privacy. The interior design by Design Unlimited in UK matches the modern looks and feel, optimizing all the space with stunning solutions. The MC155TRI is equipped with a 6.5m 12 seater RIB stowed on the side hull recess on port side. A second 7-seater RIB is concealed within the foredeck. Two jet skis & kayaks are housed in the hull recess on starboard side. 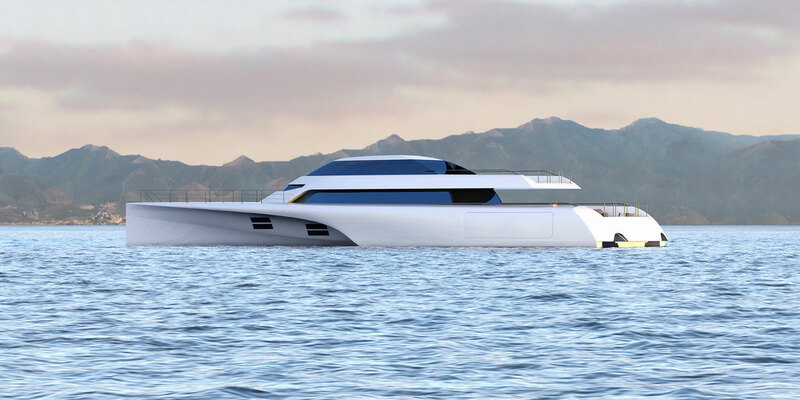 Frers Design and McConaghy are now working on an explorer/support vessel version and expanding the range with 30m to 60m versions of this design, opening the path for building fast long-range commercial vessels in the future.